Folk dances reflect the ideals, thinking process, customs, rites, religion and special features of the society in a natural way. Here is a short description of various folk dances from India. Indian culture includes a treasure of a variety of folk dances. The diversity in culture and tradition is reflected in the variety of Indian folk dances too. The tradition of folk dances is continuing from Vedic period. Folk dances of each country reflect the customs, rites and behavior of each country. Folk dances strengthen mutual relations and provide happiness and establish peace and harmony in the society. Folk dances are usually related to religious festivals, agricultural processes or natural or geographical conditions. Folk dances reflect the ideals, thinking process, customs, rites, religion and special features of the society in a natural way. Here is the short descriptions of folk dances from India. Here is brief review of folk dances from various regions of India. The Bundelkhand area of Madhya Pradesh, well known for its folk dance ‘Jawara’ reflects the great joy and excitement of the people for a good harvest season. The dance is performed by both men and women. The women wear colourful costumes and jewellery, balancing pots skillfully full of Jawara on their heads while dancing. The accompaniment includes a rich variety of percussion, stringed and wind instruments. Karma, Jatra and Paika are some of the most important dances of Bihar. In the Bhadra month on Ekadashi day, a branch of the Karma tree is planted and worshipped by offering a ritualistic dance. Everybody from the elders to the children drink rice beer called Handia and dance for 3 days continuously. The dances of Bihar vary from religious to Adivasi dance. Chhau dance of the Saraikella of Southern Bihar is the most well known dance. The folk dance of Bihar is known as Chhau dance, which depicts enormous vitality and virility. The word ‘Chhau’ comes from the Sanskrit root ‘Chhaya’ meaning shade. As masks form an important feature of this dance it is called ‘Chhau’, which means mask. The stages are decorated and brilliantly lit by a large number of torches, lanterns and flickering oil lamps. Ragas of Hindustani music is the main base of the tunes. The musical instruments used are the Dhol ( a cylindrical drum), Nagara ( a huge drum) and sSehnais (reed pipes). The dance is performed by men and boys. As it is difficult to dance for very long with a mask, the dance does not last more than 7-10 minutes. The three main elements of classical dance, namely Raga (melody), Bhava (mood) and Tala ( rhythmic timing) form an important aspect of Chhau dance. This is because it follows certain traditions of the classical mode. Chhau dance is an expression of a mood, state or condition. They also depict nature and the animal world. Sagara Nritya (ocean dance), Sarpa Nritya (serpent dance), Mayura Nritya (peacock dance), etc., are examples of the different forms of dances. The dance may also consist of themes taken from mythology and everyday life. Chhau dance is a dance full of vitality and robustness, unlike any of the Indian dances. The entire body and entire being of the dancer is employed as a single unit, as his language. This body language is extremely poetic and powerful. The legs form an effective means of communicating the expression. Although the face is covered by the mask it mysteriously expresses the feelings to be communicated. In Mayurbhanj, Chhau is performed mainly in Saraikella On the 25th day of the Chaitra month, the Lord Shiva invocated and the dances began. Chhau is mainly a male dominated art. However in recent years women have taken to Saraikella and Mayurbhanj. The leading exponents of the Chhau in Saraikella have been the royal princes in Mayurbhanj, the lower classes, the rabble and Purulia farmers, tillers and the like. West Bengal, the state which has given us many of our renowned poets, thinkers, artists, has a rich tradition of folk art. Brita or Vrita dance is one of the most important traditional folk dances of Bengal. This is an invocational dance performed by the barren women of Bengal who worship in gratitude after their wish is fulfilled. Quite often, this dance is performed after a recovery from a contagious disease like small pox, etc. Kali Nach is another dance performed during Gajan, in honour of the Goddess Kali. Here, the performer wears a mask, purified by mantras, and dances with a sword, and when worked up can make prophetic answers. The ‘Dalkhai’ is a dance performed by women of the tribes from the Sambalpur district of Orissa. It is quite a virile dance rendered during the time of festivals. 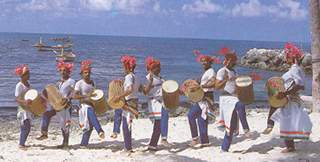 The men generally play the musical instruments and the drummers often join the dance. A dummy horse version is the Chaiti Ghorha, danced by a community of fisherfolk. The performers are all men. Apart from dancing, the performers sing, deliver homilies of sorts, and offer brief dramatic enactments peppered with wit and humour. Dancing on stilts is fairly common among the Gond children of Madhya Pradesh. The dance is popular in the Vindhyas and the Satpura ranges. This is danced in the rainy season from June to August. The dancer who has his balance on the stilts (Gendi) perform even in water or on marshy surface. The dance is brisk, and ends with a dance in pyramid formation. This is generally confined only to children and the attraction consists in balancing and clever footwork. In the villages where the wheat seedlings festival, Bhujalia, is celebrated, children prance on their gendis, collect near the village pond or the river in which bhujalias are to be immersed. Other children, dancing to the accompaniment of musical instruments join the group and they dance together. Sometimes, womenfolk also join them, but they do not use stilts. The Gendi season begins on the day of Bak Bandhi festival in the month of June and concludes after the Pola dance celebrations in the month of August. It was thanks to the pioneering efforts of Ramchandradeva that Goti Pua (or boy dancers) came into being, during the latter half the 6th century. The last of the great dynasties of Orissa had collapsed and the Mughals and Afghans were in the midst of a tug-of-war. Ramachandradeva, the Raja of Khurda (a principality in Orissa) had provided refuge to Mughal soldiers who had been defeated by the Afghan troops, and was consequently in the good books of Emperor Akbar. He was designated Gajapati or King of Orissa, with allegiance to the Mughal Viceroy. He was also appointed Superintendent of the Jagannath temple in Puri. Ramchandradeva was not only an able ruler but also a sensitive and enlightened man. During his reign, maharis or devadasis attached initially only to temples, came to be patronised by the courts. It was in his time, too, and on his initiative, that another tradition of dance, came into being – the tradition of goti puas, the boy dancers. Another reason that traces the emergence of goti puas is that the women dancing on the pretext of worship was greatly disapproved by Vaishnavas. So to eliminate the problem, the custom of dancing by boys dressed as girls was introduced. The boys are also students of akhadas, or gymnasiums established by Ramachandradeva in Puri, at the boundaries of the temple. Hence they were also known as Akhada Pilas -boys attached to akhadas. The mahari and goti pua dance styles co-existed, each independently, but with common roots. The Odissi dance as we know it today has evolved from a curious amalgamation of both these dance traditions. The word goti means ‘one’, ‘single’ and Pua, ‘boy’, but the goti puas always dance in pairs. Boys are recruited at about the age of six and continue to perform till they are 14, then become teachers of the dance or join drama troupes. Goti puas are now part of professional teams, known as dals, each headed by a guru. The boys are trained for about two years, during which, after having imbibed the basic technique, they learn items of dance, ornamental and expressional. The goti puas, being youngsters in their formative years, can adapt their bodies to the dance in a far more flexible manner as opposed to the maharis. Needless to say, one of the most demanding aspects of the dance tradition in Orissa – the bandha, which involves intricate contortions and positions of the body – is the domain of the sprightly goti puas. A goti pua presentation is ably supported by a set of three musicians, who play the pakhawaj, the gini or cymbals and the harmonium. The boys do the singing themselves, though at times the group has an additional singer. The goti pua performance is far more organised than that of the maharis, and includes items like Panchadevta Puja, Bhumi Pranam and Battu. A goti pua performance usually commences with Bhumi Pranam (salutation to Mother Earth), and wraps up with Bidahi Sangeet, a farewell song and dance item. The whole performance lasts around three hours. During the Chandan Jatra festival, along with the maharis, goti puas are ferried in boats down the Narendra Sarovar, a holy tank in Puri, to perform before the deities. The Jhoolan Jatra, celebrated every August, is the ocassion when the goti puas completely overshadow the maharis. Today, the surviving goti pua dals belong to villages and some prominent groups are from Dimirisena and Raghurajapur near Puri, and Darara, near Bhubaneswar. In the past goti pua artistes were patronised by Zamindars and were much in demand during festivals like Dol Purnima, or Holi and Dussehra. Like the maharis their existence too is gradually fading into oblivion. The dance of the Kashmiris is called as ‘Dumhal’ with long colourful robes, tall conical caps, studded with beads and shells; the menfolk of the Wattal perform this dance on specific occasions. While dancing, the performers sing too, with drums to assist their music. The party of performers move in a ritual manner and dig a banner into the ground at a set location on set occasions. The dance begins with men dancing around this banner. Hikat, danced by women, is a modification of a game played by children. Forming pairs, the participants extend their arms to the front gripping each other’s wrists and with the body inclined back, go round and round at the same spot. Dance and music is a way of expression for the people of Himachal Pradesh. In all regions, people living in this place of natural beauty, embellish themselves for the dance at all times. The breathtaking landscapes and artistic history is garlanded by the passion for dance in this land. The valley of Kulu, celebrates Dussehra with great grandeur and splendour. There is singing and dancing, around a collection of images of Raghunathji, brought from different temples. There are different dances for different occasions. Collectively all dances are called Natio. No festivals or social ceremonies go without dancing. Different regions in Himachal Pradesh have different dances. In most of the dances, men and women dance together in a close formation. The autumnal hue is celebrated in September by a dance performance called Namagen. The most striking dance amongst these is the Gaddis. The costumes are largely woollen and richly studded ornaments of silver are worn by women. The dances in Uttar Pradesh range from simple performances to ceremonious ones. They are called the Doms and the Bhotiyas. Among these the Dhurang or Dhuring are related to death ceremonies. These dances aim to free the soul of the dead person from evil spirits. This dance has robust movements and remind one of the hunting dances of Nagas on the eastern borders of India. The Jhumeila, the Chaunfla of Garhwal and the Hurka Baul of Kumaon are seasonal dances. The Hurka Baul is performed during paddy and maize cultivation. On a fixed day, after the preliminary ritual, the dance is performed in different fields by turns. The name of the dance is derived from hurka, the drum which constitutes the only musical accompaniment, and baul, the song. The singer narrates the story of battles and heroic deeds, the players enter from two opposite sides and enact the stories in a series of crisp movements. The farmers form two rows and move backwards in unison, while responding to the tunes of the song and the rhythm of the players. A famous dance of Kumaon, Uttar Pradesh, is the Chholiya, performed during marriages. As the procession proceeds to the bride’s house, male dancers, armed with swords and shields, dance spiritedly. Amongst the occupational groups, the most enthusiastic dancers are the dhobis, the chamars and the ahirs. The dhobis dance to celebrate any significant occasion. They sing and dance on the occasion of a birth or marriage, and during Holi or Dussehra. There are Rasa Dances that revolve around the early life of Krishna. The most interesting group of dances are the dances of the agricultural community which revolve round the annual seasons and which have a ritualistic and a functional dimension. One of the most popular dances of India performed during Baisakhi by the men in Punjab is the ‘Bhangra’. Among the most virile and captivating dances of India it includes tricks and acrobatic feats. The songs include recitation of meaningless ‘bolis’, words, such as hoay, hoay. The drummer usually in the centre of the circle, is surrounded by men dressed in lungis and turbans. The dance performed by the women folk of Punjab is called the ‘Gidha’. In the Gidha, at a time a woman or a pair of women dance while the others clap in rhythm. The dance is performed in the festival of Teeyan to welcome the rains. This dance also includes a step when women go round and round with feet planted at one place. Jhoomer is a dance of graceful gait and self-surrender and is, sometimes called the cool dance of Punjab. This is also performed in a circle. Dancers dance around a single drummer standing in the centre. 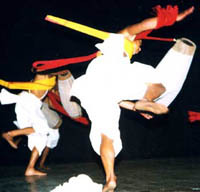 Luddi is also a male dance of Punjab. It is danced to celebrate a victory. The performers place one hand at the back and the other before the face copying the movement of a snake’s head. Jalli is a religious dance associated with the Pirs. It is usually performed in a sitting posture. Sometimes it is also danced round the grave of a preceptor. 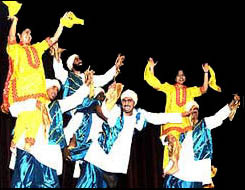 Read more about Bhangra Folk Dance in Harvest Folk Dances. The folk dance of Haryana is known as the ‘Dhamyal’ or the ‘Duph’. The dance can be performed by men alone or with women. The Duph which is a circular drum is played nimbly by the male dancers as they dance. In Haryana during the spring after work in the fields has been done with comes the time for celebration. Lahoor is the dance performed by women accompanied with songs which are phrased by witty questions and witty replies. The folk dance of Assam is called ‘ Bihu’. Everybody from the young to the old, rich and poor take delight in the dance which is a part of the Bihu festival. The festival comes in mid-April, during the harvesting time which lasts for a month. During the day all the young men and girls gather and dance together though they do not mix much. Drums and pipes are played and usually love songs are sung. The dances are performed in circles or parallel rows. The Dances of the Nagas portray the sense of fun and zest in their life. The Zemis, Zeliangs and other tribes of Assam have a series of dances. Harvesting season is naturally the time for celebrations. All the Naga tribes have their particular harvest dances. The characteristic feature of all Naga dancing is the use of the human figure in an erect posture with many movements of the legs and comparatively little use of the torso, and the shoulders. Khamba Lim is performed by two groups of men and women who stand in two rows. A similar dance is known as the Akhu. Hajgiri is the folk dance of Tripura, the land of a large tribal population. The dance is performed by young girls who demonstrate a series of balancing skills and instruments of their kind. The dances are a part of their ceremony to appease the goddess Lakshmi, to ensure a happy harvest, as cultivation forms a main source of their livelihood. The compounds of their own houses are used as dancing grounds by men and women during principal festival. To celebrate the remembrance of the evolution of Khasis, indigenous democratic states called Hima, ‘Nongkrem’ dance is performed during autumn at Smit, in Meghalaya. The Khasis are a tribe of Meghalaya who also celebrate the ripening of paddy for threshing, by dances and songs. The Thang-ta dance of Manipur was an evolution from the martial arts exercises encouraged by the kings of Manipur. The dance is exciting and is performed by young men holding swords and shields. One of the instruments that dominates Manipuri dances is the drum. Dhol Cholom, a drum dance is one of the dances performed during Holi. The folk dances capture the movements of everyday life as well as animals and birds. In Arunachal Pradesh, an organised group of tribal performers perform dances, plays, musical scripts, dance dramas based on stories of Buddha. The dancers wear masks of demons or animals described in the tales of Buddha and splendid costumes. These are mostly performed in monasteries during festivals. In Sikkim the men are attracted more towards the monastic style of dancing, while the women have their own folk dance. The dances of Sikkim are different than those of Indian traditions. Masks used in dances are something close to Indian cultural dances. Dandiya is the folk dance of Rajasthan, which shows the great vigour and joy of the people there. Dressed in colourful costumes these people of the desert play skillfully with big sticks in their hands. The dances are accompanied by the musical instrument called the ‘Meddale’ played by the drummer in the centre. Ghumer dance, Raika and Jhoria are other dances of the ‘Bhils’ of Rajasthan. Similar to the Bhils are the Mina tribe who are known for the Gher Dance, while the Garasias are famous for the ‘Valar’ dance. ‘Tarpha Nach’ or ‘Pavri Nach’ is the dance of the Kokna tribals from the hilly regions of the north-west. These dances get their names from the instruments of ‘Tharpa’ or ‘Pavri’, which are wind instruments made of dried gourd, played during the dance. The performers dance in a close formation, holding each other by the waist. The dances are also performed by men alone. They form pyramids or rapidly revolve a dancer round a stout pole. Two or three women of the ‘Kamar’ tribe perform the Tera Tali. They sit on the ground while performing the Tera Tali which is an elaborate ritual with many other rituals in it. Small metal cymbals called Manjiras are tied to different parts of the body, mostly on the legs. The dancers hold cymbals in their hands and strike them in a rhythmic manner. At times the women clench a sword in between their teeth and a decorative pot is balanced on the head. The women cover their head with a veil. One of the most colourful and enchanting dances of Southern Kerala associated with the festival of certain temples is called Padayani or Paddeni. These temples are formed in the districts of Alleppey, Quilon,, Pathanamthitta and Kottayam districts. The main kolams (huge masks) presented in Padayani are Bhairavi (Kali), Kalan (god of death), Yakshi (fairy), Pakshi (bird), etc. The literal meaning of Padayani is military formations or rows of army, in folk art. It involves a series of divine and semi divine impersonations weaving Kolams of different shapes and colours and designs painted on the stalks of arecanut fronds. The performers consist of dancers or actors, singers who recite different poems for different Kolams and instrumentalists who play wild and loud rhythms on their drums called Thappu and Cymbals, etc. The actors or dancers wear Kolams which are huge headgears with many projections and devices with a mask for the face or a chest piece to cover the breast and abdomen of the performer. All the dancers singers and instrumentalists form a procession of Kali and her spirits returning after the killing of the ‘Asura’ chief Darika. Kummi and Kolattam, which is an extension of Kummi, are dances performed by the tribal women during festivals.Kummi is simple where dancers form circles and clap as they dance. The only difference in Kolattam is the use of small wooden rods in their hands which are struck in rhythm instead of clapping. One of the most essential parts of a ritual, dedicated to Mariamma, the goddess of health and rain, is the Kargam. It is performed by men, wherein they balance pots filled with uncooked rice, surrounded by a tall conical bamboo frame covered with flowers. Drums and long pipes form the musical instruments accompanying the dance. It is a popular drum dance of Karnataka. The large drums are decorated with coloured cloth, and are slung around the necks of men. The dances are at times accompanied with songs relating to religious praise or wars. The dance is performed with quick and light movement of the feet and legs. The tribes of Karnataka are basically hunters and food gatherers. They are stocked with a regular précis of songs and dances of hunting, food gathering and burial funeral rites. Kavadis are ritual dances for the worship of Lord Subramanya. At harvest time the Dodavas of Karnataka perform the Balakat, the Dollu Kunitha mentioned earlier forms a part of the ritualistic dances which come under ‘Kumitha’. Devare Thatte Kunitha, Yell-ammana Kunitha, Suggikunitha are each, dances related to the name of a deity or instrument which is balanced on the head or held in the hand. Goa was ruled by the Portuguese for many years. Hence, the European influence is very strong andis quite evident in the annual Carnival. The brave deeds of the Goan warriors is expressed in their dance Godhe Modni (dummy horse presentation) where the attractively dressed dancers perform armed with swords. Three days in a row the people are in a mood for fun and frolic. There are elaborate parades and spectacular processions other than the dances of the boys and girls. 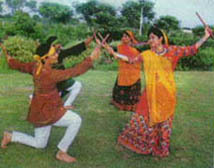 The dances of Dadra and Nagar Haveli depict their own uniqueness. Throughout the moonlit nights, the tarpa dancers encircle the Tarpakar and tap their feet while dancing. One of the most colourful of their dances is the Mask dance or Bhavada.